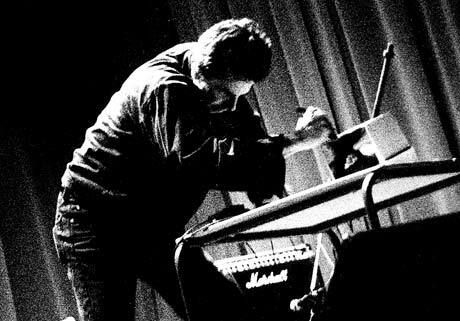 Alan Bloor is a living Toronto legend; a harsh noise warrior whos been storming the battlegrounds of what human ears can mentally and physically endure for roughly 20 years now. He has earned the undying respect of open-minded listeners who appreciate determined innovation and unrelenting non-conformism, and scared off damned well everyone else. Scyamine, Bloors first release for the highly respected Hollywood noise label PACrec, finds the man with the titanium ears at the top of his bludgeoning game, scraping all hell out of his personally constructed stainless steel instrument of choice. Bloor runs his burning metal mayhem through a plethora of intense effects to create a dense, pummelling onslaught of harsh noise that ebbs with an engaging current. Recorded and produced by Bloor in a single-day marathon session late last year, Scyamine consists of seven epic tracks that will keep your fists pumping and mind reeling (not to mention that chattering in your teeth and vertebrae) for future lives to come. The album comes appropriately sleeved in a photo of an enormous turbine engine  a fitting visual representation of (or homage to) the huge, crushing, churning sound captured on this career-defining masterpiece. Are there ever certain feelings or emotions youre trying to convey to your audience? No, not really trying to prove anything, no big emotions going through my head or anything like that. Its more just like, "This is what I do, and Im not making any sacrifices, or Im not making any apologies for what I do, Im just gonna go up there and tear it apart and thats it. Its not like Im going through any kind of big spiritual thing. Its just this gut feeling of some kind of emotion, to go up and do it. Its not really trying to prove anything, not trying to win any fans or anything like that. How did you get interested in making noise music?